Every off-road rider wants a bike that can conquer hills, logs, mud, sand…anything. 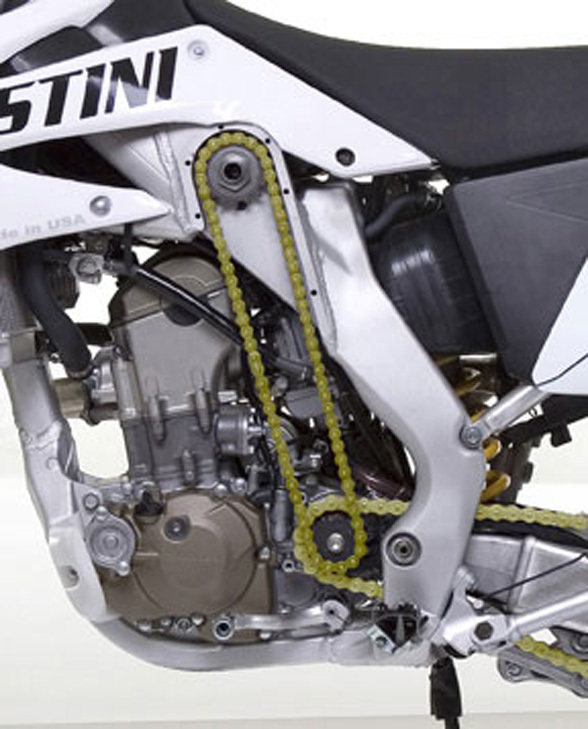 Christini AWD Motorcycles feature a patented mechanical All Wheel Drive system that allows for just that. Christini AWD bikes are used by the U.S. Military overseas, and can be found in over thirty countries, a few being Canada, Australia, Japan, Indonesia, South Africa, and Brazil. The All Wheel Drive technology works through one-way clutches in the front hub that allow the front wheel to freewheel until traction slips in the rear. Traction loss is sensed immediately, at which point the front wheel receives power from the transmission, sent through a series of chains and shafts. No hydraulic pumps or systems are required. The AWD system remains passive until the power transfer is needed, kicks in when traction is lost, then returns to being passive once rear traction is regained. This system makes it nearly impossible to wash out due to the constant and immediate ability to transfer power to the front wheel whenever it begins to stall. Rather than sliding out on turns, the Christini AWD will pull you right through, even in off-camber areas. Additionally, drivers can make a simple sprocket adjustment to change the front-to-rear power ratio, giving virtually limitless fine tuning capabilities for their riding preferences and riding conditions. In motorcycles, two wheel drive and all wheel drive are completely different technologies as is the same case with four wheel drive and all wheel drive on trucks and cars. Four wheel drive is a locked technology whereas all wheel drive is a smart system based on traction loss and sensing that loss. A simple example is that a truck locked in four wheel drive will get 5 to 8 miles per gallon because all the wheels are locked together moving at the same speed (and fighting each other). However, in all wheel drive, that same truck will still get the full gas mileage range. The patented mechanical AWD system designed by Christini AWD requires less than 1/10 horsepower to function and delivers swift acceleration, even when climbing hills. Christini’s bikes also offer great stability without torque effect. The whole system adds less than 14 pounds to the vehicle’s full weight. As of the writing of this article there are a few dealers for Christini in Canada.